New Mexico State Bill 582, passed by the legislature in 2005, states that “A public post-secondary educational institution shall not deny admission to a student on account of the student’s immigration status. ” Pursuant to that bill, the University of New Mexico considers applicants for graduate programs, regardless of citizenship, based upon academic merit and achievement. UNM graduate programs admit and enroll undocumented students and may use private funds, when available, to provide financial aid to support their studies in a manner consistent with applicable laws. SB 582 also grants in-state tuition rates for students “who have attended a secondary educational institution in New Mexico for at least one year and who have either graduated from a New Mexico high school or received a general educational development certificate in New Mexico.” For tuition purposes, in-state tuition is granted to undocumented graduate students who meet the eligibility requirements for SB 582. 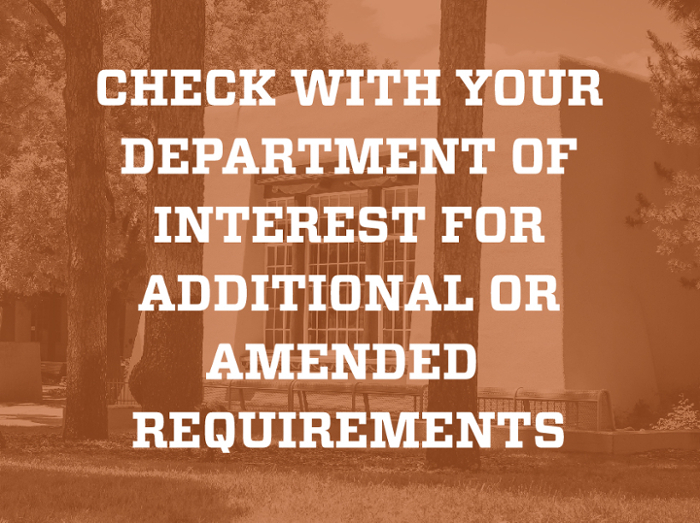 To apply for some forms of financial aid administered consistent with state and federal regulations, undocumented graduate students may complete a paper form of the FAFSA and submit it directly to the Financial Aid Office. Additional information and resources for undocumented students are available at Undocumented UNM.